You are here: Home / Uncategorized / Celebrate with Temporary Tattoos! Looking for unique and fun ideas for your upcoming celebration? Why not design your own custom temporary tattoos? Check out our ideas for ways to enhance your party and help make lasting memories for you and your guests. There is nothing like providing a unique and unforgettable experience for your party guests. 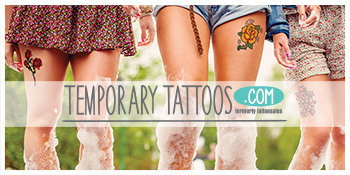 Create your own customized temporary tattoos or select form our ready-to-order options. We have a wide selection of holiday themed tattoos and thousands of other designs to help you celebrate your special occasion. Having a bridal shower? Bachelorette party? Baby shower? Birthday party? Let Temporary Tattoos help you celebrate. Be different & get crafty! Instead of handing out the same old boring party favors, jazz up your celebration! Temporary tattoos allow you to customize the experience for your guests and gives them a new and fun way to mark or commemorate your occasion. Did you know temporary tattoos aren’t just for skin? There are a multitude of ways to utilize temporary tattoos! you can put them on cups, glasses, ornaments and so much more. Impress your guests and try decorating everything at your party with them to have a full-customized theme! There are endless ways to express yourself with temporary tattoos. Our tattoos can be placed on almost any surface! try these ideas to utilize your favorite temporary tattoos at your next event, or for expressing yourself every day! Place our festive tattoos on your glassware (wine glasses, plastic cups, etc.) and apply evenly with water. This will give your glassware a fun flare to compliment your party theme. Light it up with decorated candles! Our temporary tattoos adhere easily to smooth surfaces and make wonderful accents for wax candles. Customized candles are great for gifts too! Try our metallic and PrismFoil designs to further enhance your décor. Customization is where it’s at! Whether it is a pair of sunglasses, your hand or a picture frame, add your custom temporary tattoo design to almost any surface to make your special occasion unforgettable! Tried something interesting with temporary tattoos? Let us know! Tag us on Twitter @TemporaryTats and on Instagram @Temporary.Tattoos and follow us on Pinterest for more new and exciting ideas!